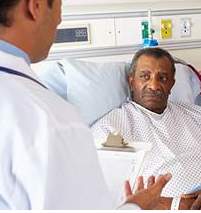 Black and white men prioritize certain treatment-related factors differently when considering prostate cancer treatment options, according to study findings presented at the 2017 American Society of Clinical Oncology (ASCO) Annual Meeting. Researchers at the University of North Carolina Lineberger Comprehensive Cancer Center reported that African American men and Caucasian men are both concerned about curing their cancer. However, African American men appear to be more likely to consider other social and personal factors as important in their decision-making process. The researchers conducted a survey of 1171 African American and white men in North Carolina with prostate cancer. They found that more black men were concerned about how various treatments would impact their daily activities. They were also more concerned about the cost of treatment and the time it would take to go through treatment and recovery. The investigators note that racial disparities in prostate cancer persist despite numerous interventions. Other studies have investigated biological, socioeconomic, and perceptual factors. This study is unique because it takes a closer look at the decision-making process. The researchers found that 74% of black men with intermediate or high-risk cancer considered the impact treatment would have on their daily activities to be very important. However, only 58% of white men rated that factor as very important. Black men were significantly more concerned about recovery time (81% vs 50%, respectively). There were significant racial differences when it came to costs, as well; 66% of black men rated cost as very important compared with 32% of white men. 1. Gordon BE, Basak R, Usinger DS, et al. Factors influencing prostate cancer treatment decisions for African American (AA) and Caucasian (CA) men. J Clin Oncol. 2017;35(suppl):abstr 6517.